Are you our next Property Partner? Well there goes another one! Opportunities don’t last long in this market. This is a quick email to let you know that our August Investment Opportunity has now sold and we are on the search for more exceptional investment opportunities for you to consider. We understand it’s not easy for you to find and negotiate easily in a property market that has fast, cashed-up investors. Having a team that works towards your goals is crucial to your investment success and will keep you top of the property game! Take advantage of our exclusive preview of the Plan Assist Membership, allowing you to claim your place on the ‘Pre-Launch List’ and lock in a special price on Elite Membership. Property Partners: Featured on our Project Management Blog, learn from one of our own Consortium Deals created by Plan Assist to maximise gains for a group of investors (including some of our members) achieving a gross margin of $670k. 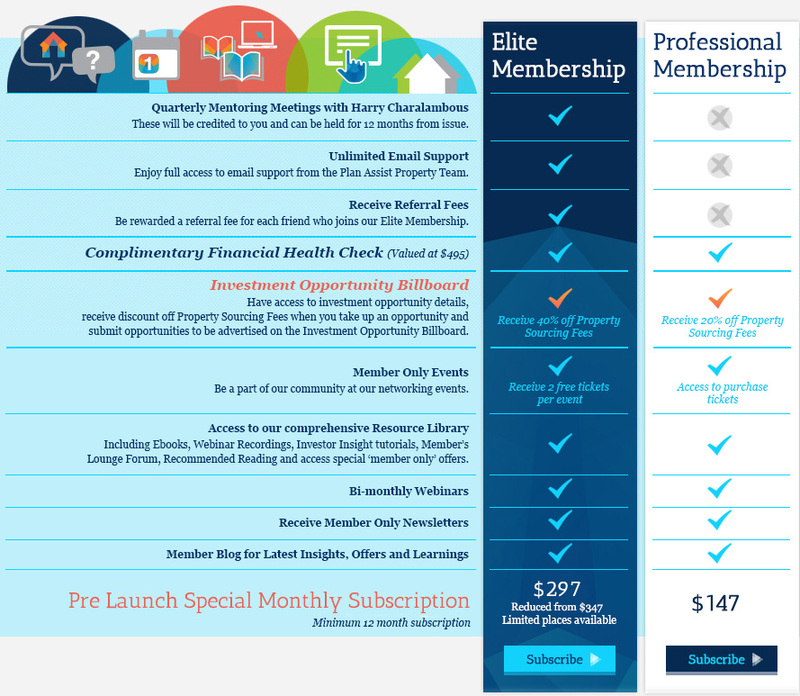 Pre-Launch Special Offer + Exclusive Preview of Plan Assist Property Team’s Membership. We are thrilled to announce that our new Plan Assist Property Team Membership is launching in October and to give a special offer to join at a pre-launch rate. As many of you know, we have provided you with the ProfitstoShare membership for the past 3 years. And after receiving feedback from our members we decided to raise the bar and create something even more special; a place where a community of keen, active property investors like you have the opportunity to network, engage and take the step up making a decision to taking action! Our Elite and Professional memberships are full of features and opportunities for a community of keen, active investors like you. Pre-Launch Strictly Limited Offer on Elite Membership for Subscribers: To lock in the pre-launch price, simply click the link below to email our Membership Manager, Cath to ensure you don’t miss out. But be quick as this offer only extends to the first ten people to contact us before midnight 7th September 2013. Please note: All existing ProfitstoShare members will be seamlessly transferred into the new membership, with further details for our PTS members being provided in the coming weeks! Property Partnership: Plan Assist Value Add Strategy generates a gross margin of $670,000*. In a recently completed project featured on our Project Management blog this month, Plan Assist Property Team delivered a group of investors (which included Membership clients) a whopping $670,000 gross margin from a property that started as a generously sized block on Sydney’s Upper North Shore region with an original condition, 3 bedroom house. This Consortium Deal involved our Buyer’s Agency, Finance, Project Management and Mentoring services, which ensured Plan Assist Property Team collectively delivered a great outcome through a proven Value Add Plan Assist Strategy. You can read the full overview of this project including costs and time frames on our blog. The Plan Assist Property Team continues to offer investments such as this to active Elite Investors of our Membership. Is this the Property Partnership you’ve been looking for? *We have indicated gross margin as this property transaction’s return. The Gross Margin is the margin before soft costs including stamp duty, DA fees, holding costs and sales expenses. With the financial world moving and dynamic, economic events occurring daily, borrowers are not aware of the daily interest rate movements that accumulate into a wave and by the time they reach you, a major change in your investment cash flow has occurred and you may have missed the boat. On my desk last week was the Interest Rate Review Sheet for all my lenders and the alarming prospect that fixed rates may turn very soon and start to climb. With Interest Rates hitting below 5% pa and a cash rate of historic lows of 2.5% pa, are you missing out on savings that can cut years off your home loan with interest rate savings?Here are 5 Key Signals to unlocking the answer of the age old question, ‘To fix or not to fix?’. What’s it worth to you: We crunch the numbers for you to consider. Timing: We tell you how to predict the lender’s cycle. How long: How long do you want to lock in your rate? Debt Stress: How at ease are you today with your mortgage? Staying flexible: What is the penalty for breaking a fixed loan? ← To fix or not to fix? That is the question.